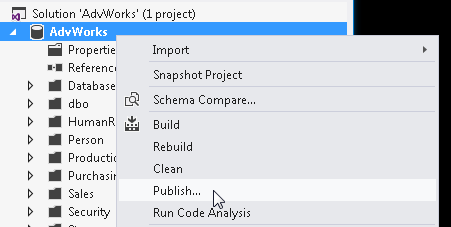 Recently I was working on another article for RedGate’s SimpleTalk site. As part of it, I had SSRS installed on a Windows 10 computer, and needed to connect to it from another computer. 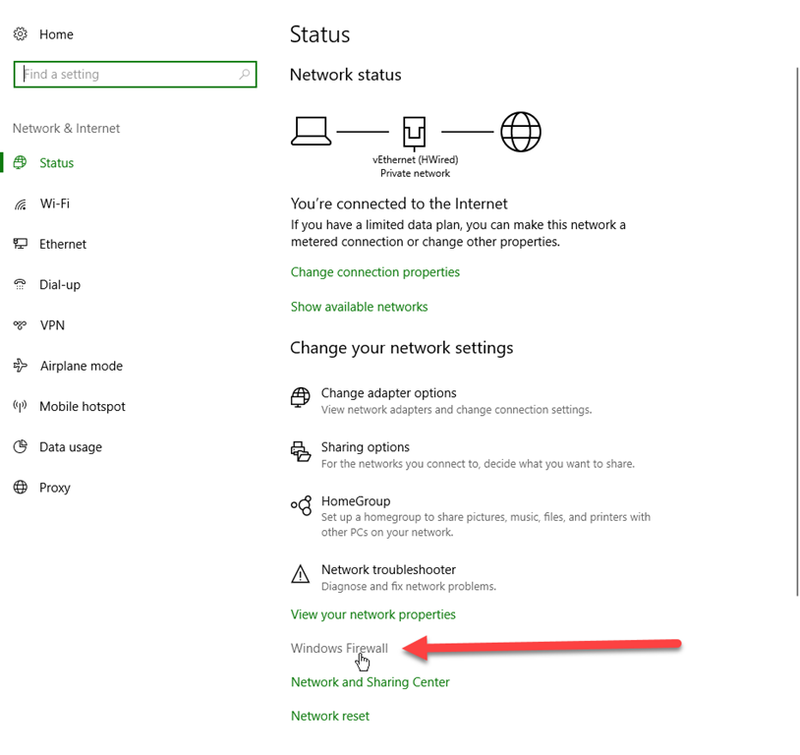 I was having a lot of issues connecting, until I remembered SSRS connects using Port 80, and by default Windows 10 (and previous versions) block Port 80 for incoming traffic. The solution was to, obviously, open Port 80 on the Windows 10 computer. Doing so was not difficult, but did require quite a few steps, and of course administrator rights on the computer. 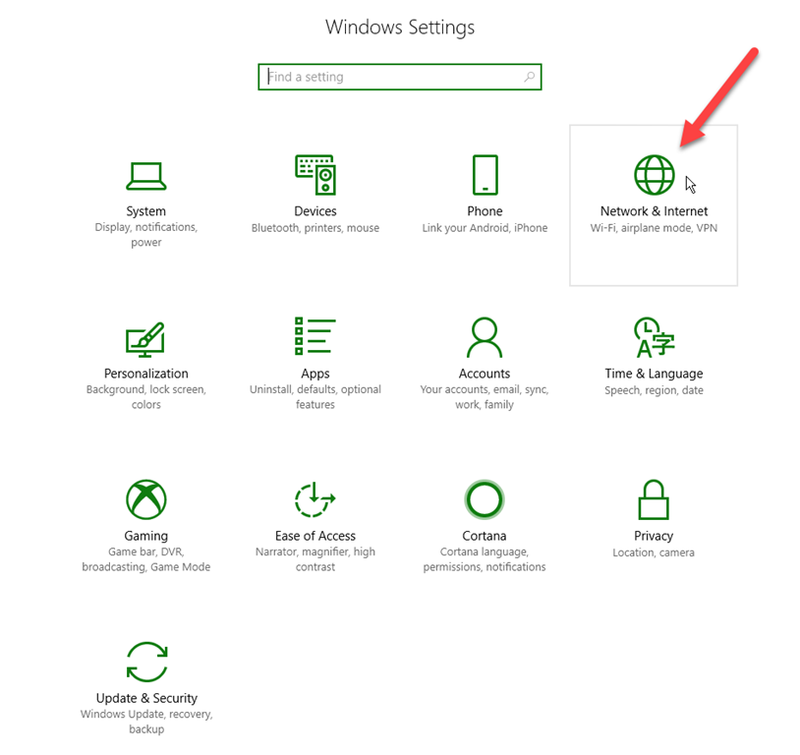 First, open the Windows 10 Settings. Then, click on Network & Internet. 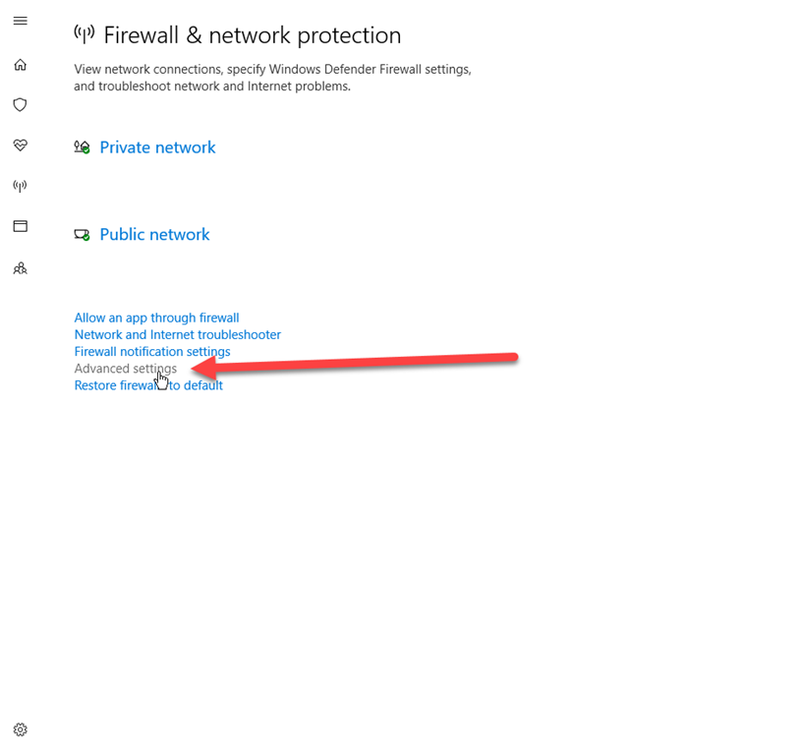 On the Status window, click on Windows Firewall. From here, click on Advanced settings. If prompted confirm you do wish to make changes. 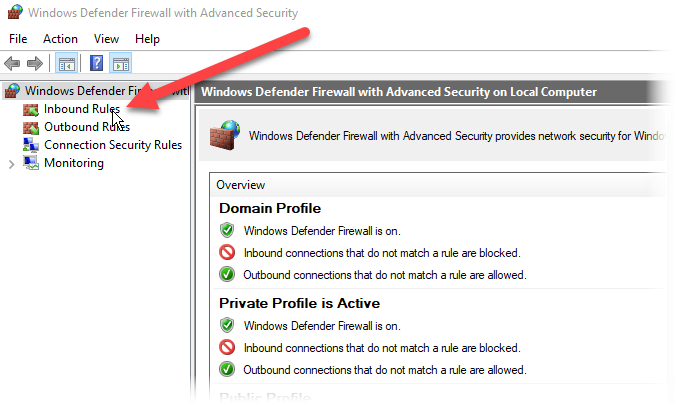 When the Windows Defender Firewall dialog appears, click on Inbound Rules. 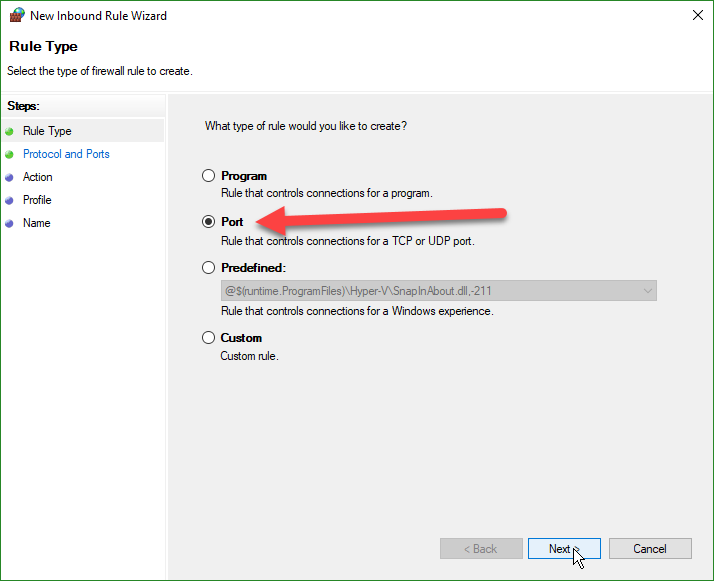 In the New Inbound Rule Wizard window, change the type of rule to be Port. Then click next. 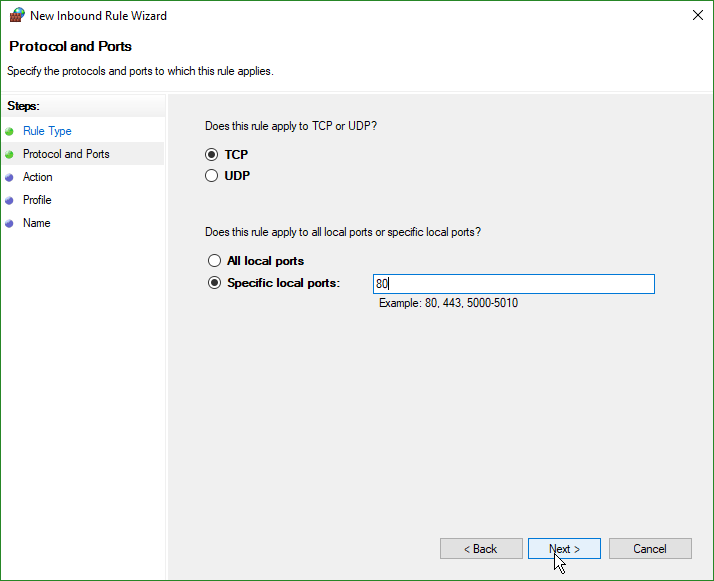 On the next window, leave the rule applying to the default of TCP. 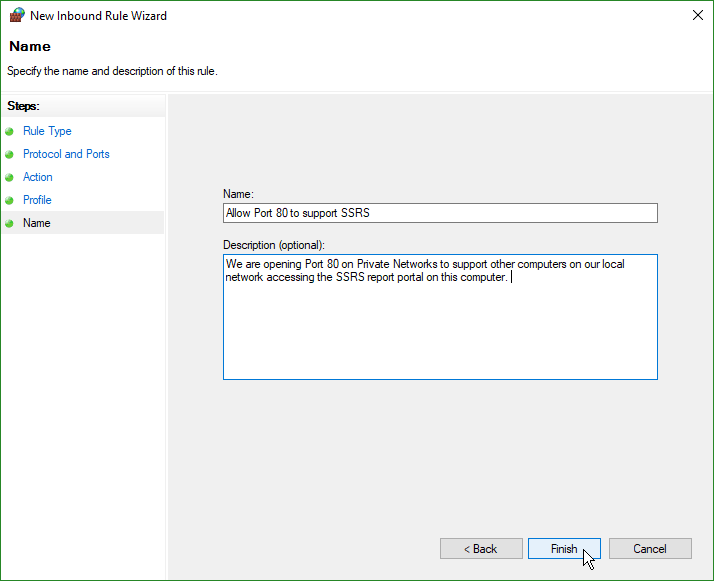 For the port, assuming you are using the default setup, enter 80 for the port number. If you setup SSRS on a different port then obviously use that port number instead. On the action page we tell Windows what we want to do if it finds incoming traffic on this port. 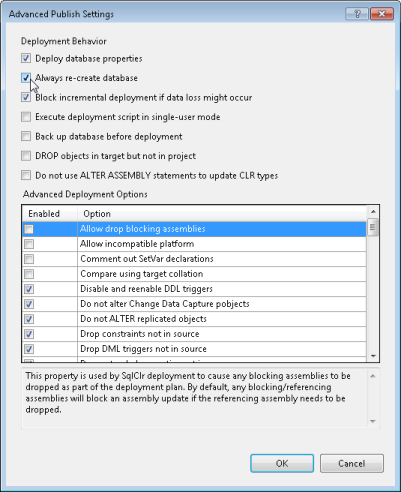 For this development environment we will take the default of Allow the connection. 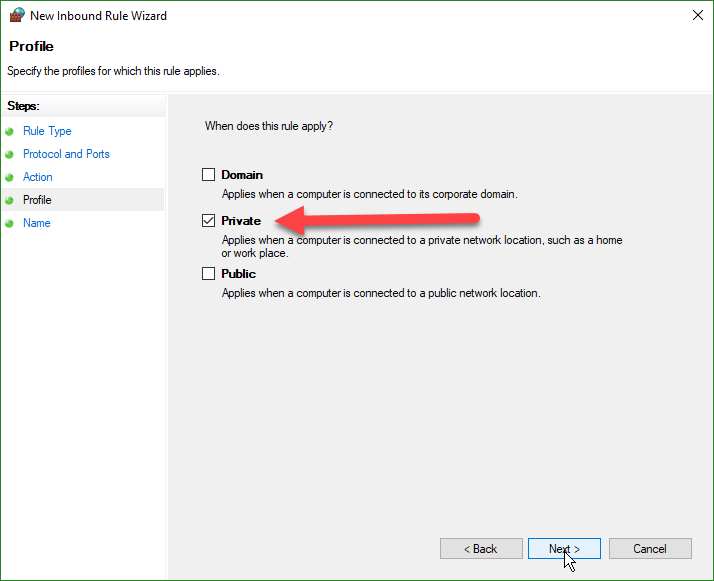 If you had setup https service on your report server, then you could take the second option of allow if secure. Next, we need to specify what network type the rule should apply to. For the scenario, I am on a small network, such as you might have at home, and that network was setup as private. Thus I am leaving Private checked on, and unchecking Domain and Public. Unchecking public is especially important if you plan to take your laptop out to a coffee shop, you don’t want someone trying to hack into your machine via port 80. When done just click next. On the last screen we’ll give the firewall rule a name, and a description. When done, click finish. As you can see, the new rule now appears in our Inbound Rules area. Once you have completed working with your SSRS server, I’d suggest you return here, right click on the rule, and either disable it, or if you know it will no longer be needed, delete it. 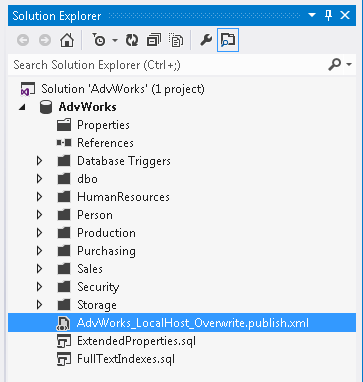 And with that you should now be able to connect to the computer running SSRS from another computer on your network. I had a weird issue with Windows 10 today. All of a sudden, my icons weren’t displaying correctly. When I had the Preview Pane on, nothing was displayed. Even more bizarre, The Layout area of the View pane in Windows Explorer, had all the icons disabled. Turned out I had a corrupted icon cache. To fix this for yourself, first open up a copy of Windows Explorer (or My Computer or whatever you wish to call it). Go to the View tab, and make sure the Hidden Items is checked on. 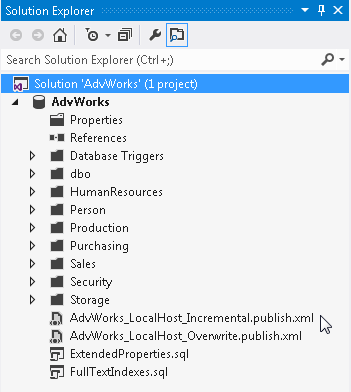 Now navigate to C:\Users\(User Name)\AppData\Local, where of course (User Name) is replaced with your user name. 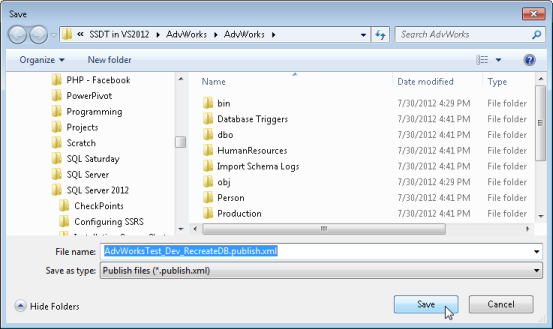 Find the file IconCache.db, right click and delete it. Yes, that’s right, delete it. It’s OK, it won’t hurt. To be really thorough, you could now head to the Recycle Bin, and clean it out, or at least open the Recycle Bin and remove the IconCache.db file. However you could skip this step if your the nervous type. OK, that done, restart your computer. When you return to the folder, such as your Pictures folder, Windows will start rebuilding the icon cache automatically, and you should now see your icons working again, and the preview pane should also now be functional. Standard disclaimer, no warranty or guarantees provided, this is what worked to me (and to be honest I’m making it a blog post to remind me should it happen again). This may or may not work for you, but as the icon cache will automatically build itself it’s pretty safe to try. Good luck! Last week Microsoft revealed there is a serious security vulnerability with the true type fond rendering code built into the Windows kernel. By simply visiting an infected website the Duqu worm can get administrative level privileges to your system, thereby installing viruses / worms on your system. Malformed MS Word documents can also be an entry vector for Duqu. To enable the fix, scroll down and click the fix it button under “Enable”. Please note: There is one drawback to this fix, once you enable it you will no longer be able to do a “Save As…” to PDF format from any Office app. You can restore this capability by disabling the Fix It by clicking the appropriate button under the “Disable” option in the above url. I have successfully tested the fix enable / disable and was able to restore the ability to save as to PDF. For the time being I will be running with the fix enabled. If I need to export to PDF I can visit the site, disable the fix, and save to pdf, then re-enable. While disabled I would not be going to any websites. This is a fairly serious issue that is already being exploited to infect machines. To protect yourself, along with your business and / or clients, you should consider using this fix until a permanent solution is provided by Microsoft. Also note that this week’s “patch Tuesday” updates included some critical security fixes. If you do not have your box setup to automatically apply updates, you should go to Windows Update and get the latest patches. A big thanks to Steve Gibson (@sggrc) and his Security Now podcast on the TWIT.TV network, where I heard about this. If you aren’t listening to the Security Now podcast, you should. I’ve long held it should be required listening for any IT Professional. I attended a great user group meeting tonight, where fellow MVP Jeff Barnes presented on Windows Azure. I learned quite a bit. I didn’t have much time to work with my Windows 7 install, but do have some link love to pass along. First off though, the apps. WinAmp – First off was my old standby for ripping CDs (yes, that I legally own) and playing music files is WinAmp. I installed version 5.54 tonight, they player seems to work fine. The only problem I had was getting it to install skins. First, there was no file association setup for them. Easy to fix, first I had to download the skins to another drive, then set the file association for the .wal file to winamp.exe. But even then it did not install. I figured out it’s a permissions issue, by default Windows 7 requires elevated rights in order to write to the program files folder. I figured this out when I was copying the files from my download drive to the WinAmp Skins folder. It prompted me for permission to continue. After copying the files, I was able to find the skins in the WinAmp Menu. I’m guessing the only thing I would have to do is run WinAmp as admin when I want to install new skins, or fiddle with the folder permissions for winamp.exe. Frankly I’m glad Windows 7 is restricting rights to the program files folder, although apps that write files (like Winamp with it’s skins) to the same folder as the application may run into issues. For me though it’s not a big deal, I generally only use 1 skin (MMD3) so I’m set. Pismo File Mount – The second tool I installed was a freeware ISO mounter named Pismo File Mounter. One of my Twitter friends (@cfrandall) kindly pointed it out to me. It’s pretty simple, just right click on an ISO and click Mount from the menu and there it is. Seems to work fine, I was able to browse files and what not. Tomorrow I will start installing some applications from ISO and let you know how well it works. Now for a little link love. Windows 7 Beta Home – The official Microsoft Windows 7 home page, has links to the beta program so you can get your own copy of Windows 7 and be one of the cool kids. Also has links to the Windows 7 blog, desktop themes, and more. Tim Senath’s Musings – Tim is a client platform guy form Microsoft. His blog has a great bumper crop of Windows 7 secrets. I picked up several valuable tips that I’m already using. I love the one of double clicking on the upper or lower border of a window and it maximizes the window height wise, but leaves the width alone. Using WIN+SHIFT+LEFTARROW and WIN+SHIFT+RIGHTARROW to move a window back and forth between monitors is also becoming a favorite. Check out his blog post for a lot of other great tips and tricks, some of which even work under Vista. 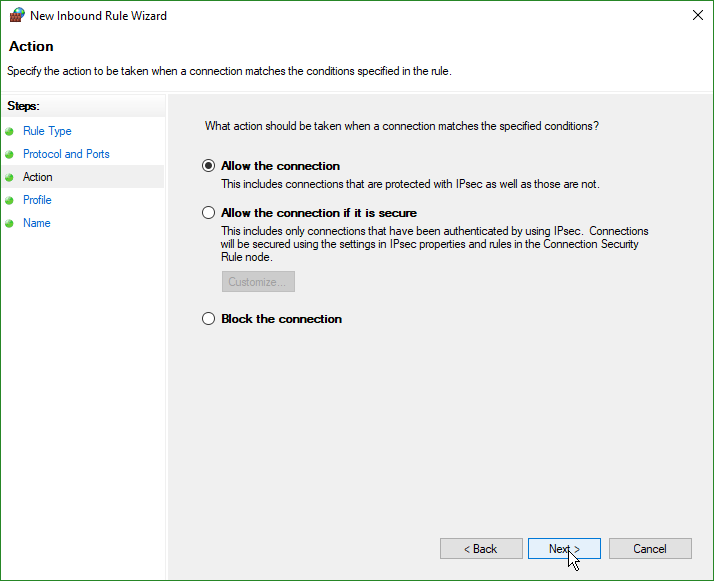 Marlon Ribunal’s Blog – Marlon has a good post with links to Windows 7 Beta Reviews and other articles. Windows SDK for Windows 7 and .Net Framework 3.5 SP1 Beta – If you are doing development specifically for the Windows 7 platform, you will likely want this SDK for Windows 7 and .Net 3.5 SP1. Like Windows 7, this SDK is also in Beta. And finally, if you are tired of answering the “well what’s new in Windows 7?” question from all your friends, family, and co-workers, point them at Paul Thurrott’s SuperSite for Windows. He has a Windows 7 FAQ that answers all sorts of questions and has a nice list of all the new features. It’s Tuesday, and the march to install software in my Windows 7 install goes on. Good news for today, everything was favorable although I did get slowed down downloading the latest VMWare. Speaking of which, we’ll let it start the list. VMWare Workstation 6.5 – Installed with no problems, everything seems to be working fine. It recognized my USB devices, network, etc. Camtasia Studio 5 – Installed and works no problems. SnatIt SnagIt 9 – Had a hic-cup installing the first time, just seemed to install. In retrospect I may not have given it long enough. I rebooted, and to be safe started the install in Admin mode, it installed and works just fine. Bayden SlickRun – works great, no problems. TrueCrypt 6.1 – Works fine, mounted the drive OK.
Live Mesh – Works fine, I loaded it on my Windows 7 machine and was able to login to the website on another computer and remote control my Windows 7 box with no problems. Corporate VPC – My companies VPC software installed and ran just fine with Windows 7. I can’t say much else about the software since it’s something proprietary but my co-workers will be pleased to know it works. And that’s it for today. All in all I have been very pleased with my Windows 7 experience. I have been taking it slow, installing my software one at a time, testing, and verifying basic functionality. Tuesday night I have a Bug.Net meeting on my calendar, so it may be Thursday before I get a chance to do more software installs. One follow up from yesterday, I was told Virtual Clone Drive will work under Windows 7, but causes the Windows 7 shutdown to hang. Haven’t tried it yet, if anyone knows a free ISO reader that works under Windows 7 please leave a comment.